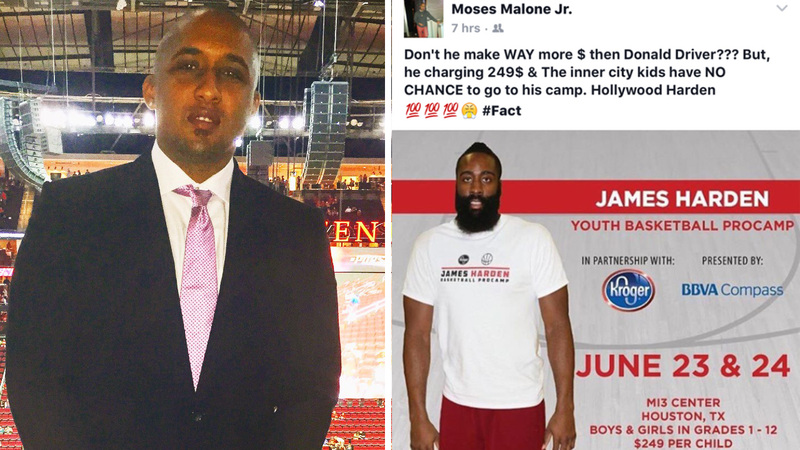 HOUSTON (KTRK) -- Moses Malone Jr., son of basketball legend Moses Malone, said he was attacked by Houston Rockets guard James Harden's entourage outside a nightclub early Saturday morning. Malone Jr. said he wrote a post on social media criticizing Harden for charging too much money for his youth basketball camp. Eyewitness News received a screenshot of Malone's Facebook post. In it, Malone wrote, "Don't he make WAY more $ then (sic) Donald Driver???? But, he charging 249$ & the inner city kids have NO CHANCE to go to his camp. Hollywood Harden #Fact." Malone said he believes Harden got mad and sent his entourage to beat him up and steal his jewelry. At least four of the men had guns, according to a Houston Police Department spokeswoman. Malone's attorney, George Farah, said the stolen David Yurman jewelry was worth about $15,000 and that the club security guards were complicit in the attack. Carl A. Moore represents V Live. He said the claims that security guards did not help Malone is false. "I don't believe Mr. Harden was at the club, and I definitely don't believe he had anything to do with an attack on Mr. Malone," Moore said. "And so the club's position is that Mr. Malone is a regular of the club. We would have done everything we could to make sure he was safe." HPD's robbery division is investigating the crime. No one has been arrested so far. Eyewitness News called and emailed a spokeswoman for the Houston Rockets for comment on the allegations against Harden. That spokeswoman has not yet responded.